The Apple Watch is the most popular watch model on the planet. In fact, Apple even outsold Rolex during the holiday quarter to become the #1 watch company in the world. Of course, that means if you own an Apple Watch, you have the same watch as millions and millions of other people. If you want to set yourself apart from the crowd a bit, a new band is the way to do it. In this post, you’ll find five options that are all stylish and affordable. 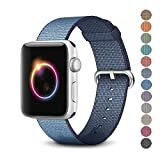 In fact, you can buy all five of them for less than the cost of one Apple Watch band from Apple, which can cost hundreds of dollars for no real reason. 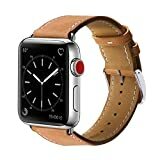 Fit Size: Fits 6.3″-7.9″ (160mm-200mm) wrist, it can be men’s or women’s, comfortable touch feeling on your wrist, simple but attractive, look fantastic and giving a nice professional look on any occasion.If you are looking for a 38mm version, please search B01EY9TWV0 on Amazon. Notice: Please ensure you choose “Sold by Marge Plus” for guaranteed quality. We are the ONLY authorized retailer of our brand. If you have any problems with your order please contact us for prompt and courteous service. Our contact information can be found on the every genuine Marge Plus box. 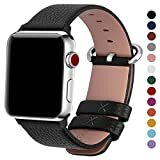 Superior Quality: 100% Genuine Leather Band – Premium soft top genuine leather with fashionable craftsmanship, New stylish design, comes with stainless steel polished silver-coloured Classic buckle, anti-slip & sweat-absorbent. Superior Quality: Fullmosa® 100% Genuine Full Grain Calf Leather Band – soft and comfortable to the touch. No plastics or cheap fillers. Certified RoHS compliant – free of hazardous and toxic substances.For more product options, please visit our store by clicking the blue Fullmosa logo above the product title. Fit Size: Compatible with Apple Watch 42mm ALL Models, including: Apple Watch Series 3 / Series 2 / Series 1 / Edition / Nike+ / Hermes. 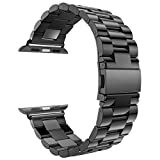 Fit for 6.30″-7.92″(160mm-201mm) wrist. 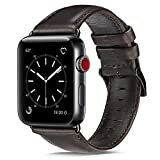 Genuine Leather: Crafted from genuine cowhide leather with fashionable craftsmanship, luxury style and personalize your Apple Watch. Note:The color may vary somewhat because the natural variability of the leather, it is normal appearance. 18-Month Warranty: We promise unconditionally refund or resend with any quality problems, lifetime friendly customer service.